The Bridgepoint Commercial Carpet Maintenance Procedures Guide is a FREE step by step training tool that lays out a complete planned maintenance program. 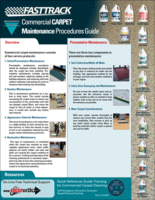 This four page guide walks the commercial cleaning technician through the procedures necessary for preventative maintenance, routine maintenance, appearance maintenance, restorative maintenance, and spot & stain treatment and removal. In each section, specific Bridgepoint chemistry is applied through a variety of cleaning equipment. Special procedures are outlined for various challenges encountered in the commercial environment including: normal soiling, heavy soiling, commercial olefin or triexta fiber, and wool carpet. It even outlines what procedures and chemicals to use for carpets that require cleaning with Carpet & Rug Seal of Approval products and Green Seal Certified products. A special hints and tips section highlights specialized chemistry available, and ways to increase speed and efficency in cleaning while reducing drying times. The procedures guide encompasses low moisture encapsulation cleaning, surface hot water extraction, and high performance hot water extraction cleaning. Download your free copy today below.